Reader Angie recently sent me some pictures of her Yuan Shi Kai dollar for evaluation. After a quick examination, I instantly knew the coin was fake. It is particularly interesting nonetheless. Can you spot what is wrong with this coin? Well, aside of the usual suspects (colour, crude calligraphy…), the main problem is in the date. Yuan Shi Kai dollars have been struck continuously from 1914 to 1921, but only four dates appear on the coins: 3rd year of the Republic of China, 8th, 9th and 10th year. Even if you can not read Chinese, the coins made in the 3rd year (1914) are easily identifiable because there is only six characters above the bust of Yuan Shi Kai. Subsequent years all have seven characters, due to the addition of the character “造” (which means “Made during…”). I had already seen some fake Yuan Shi Kai coins were the characters had been replaced by floral patterns, but I had never seen that kind of forgeries before. It can apparently be bought for a little more than $1 USD on TaoBao (the equivalent of eBay in China). This is an interesting case, as the forger has boldly chosen to rely on the collector’s excitement and pride at the idea of having found a rare, previously unknown variation of a common coin to lure them! Having only recently diversified into Chinese coins, I was pleased to read this information and checked one of the coins I’m bidding on had the six digits and it is described as 1914.
how much this coin’s in USD currently price? A common “fatman” dollar in XF condition will be worth about $120 USD. what about the 5 Yuan Yuan Shi Kai coins? I miss photos of that one’s in your pages. What are the measures: Diameter, weight? - what material are they made of? - if it contents iron it should be easily identified whit a magnetic test-isn’t it? The standard diameter for YSK dollars must be 38mm and weight 26.4 grams. The material used for making fake coins varies a lot, for bad iron based alloys (which are magnetic) to “white copper”, tin… Most of the fake coins are underweight. Some fake coins are actually made from silver, using high quality dies. It is then often quite difficult to tell them apart from real coins without a lot of experience. I recently purchased a ‘YSK dollar’.Reading your comments on fake coins I noticed that some fake coins you’ve come across have floral patterns instead of chinese symbols,mine is one such coin.However the coin does weigh 26.4 g and measures 38mm.Are these floral coins meant as a counterfeit because surely you cant sell it as a YSK dollar with floral symbols.Were these coins meant for something else and do they hold any value? Several readers have come across such Yuan Shih Kai dollars with bats or rosettes. I would say that these types may have different origins. The five bats fantasy coin is likely to have originated as a charm, or novelty “lucky” item. The Yuan Shih Kai dollar is a very famous coin in China, affectuouly called “袁大头”, and adding the five bats (五蝠／五福 wordplay) motif on a replica makes it similar to horseshoes or four leaf clover themed items sold in the West. It was therefore probably sold for a cheap price to Chinese and tourists alike, without the direct intent to deceive collectors, since this particular pattern would never be added on genuine, government-issued coins. The replica with a rosette is another thing entirely. The only reason to add this is to lure beginners into thinking they found some rare variety and disregard other red flags raised by the fake coin. 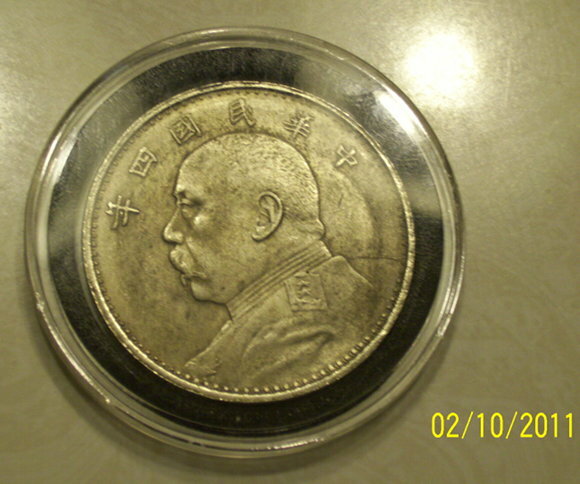 This version is a deliberate attempt to deceive collectors, like the fake Peiyang warlord variety discussed here: http://www.dragondollar.com/coins/chinese-coins-2/fake-chihli-dollar/ – this is also why this version has a somewhat acceptable weight, compared to the “Five bats” version which is typically severely underweight at around 20 grams. Dear Sir, would you know where the silver mines were located that the material for this issue of coins came from?